"The consistency of these findings among the varying ethnic/racial groups underscores the importance of educating the public on eye health and mobilizing public support for vision research," the researchers added in a news release. The nationwide online poll, commissioned by the nonprofit health research group known as Research!America, found that 88 percent of more than 2,000 respondents considered good vision vital to overall health. And 47 percent said losing their sight would have the most effect on their day-to-day life. Overall, respondents ranked losing vision as equal to or worse than losing hearing, memory, speech or a limb. 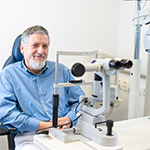 The top concerns associated with vision loss were quality of life and loss of independence. Close to two-thirds of the respondents said they wear glasses. But respondents' awareness of eye diseases varied widely. Sixty-six percent were aware of cataracts; 63 percent, glaucoma; 50 percent, macular degeneration; and 37 percent, diabetic retinopathy. One-quarter of the respondents were not aware of any eye conditions. While 76 percent and 58 percent, respectively, knew that too much sunlight and family history were potential risk factors for vision loss, only half were aware that smoking puts eyesight at risk. The study was published online Aug. 4 in the journal JAMA Ophthalmology.